This is a shooting game used to gain more exposure to programming with 3D concepts. 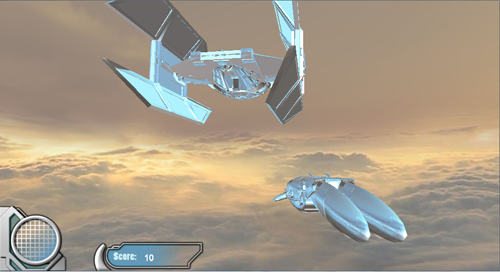 The game was made for a graphics course that had an open-ended choice of a final project. We were allowed to produce any sort of demo that used either OpenGL or raytracing techniques. I chose to do a use OpenGL (realtime) for the opportunity to make an interactive demo. 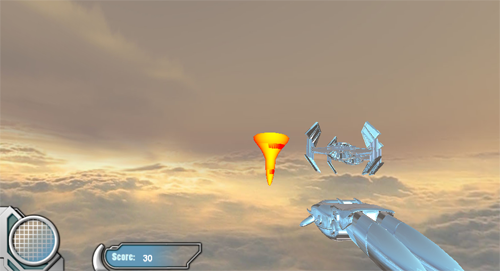 In the game, the player shoots down enemy ships and scores points. The missles are shot from the player's ship outward depending on where the ship is pointing. The ship is controlled with the I,J,K, and L keys. Dragging the right mouse button can be used to rotate the camera, and the scroll wheel zooms in and out. Pressing 'Z' fires a missile. 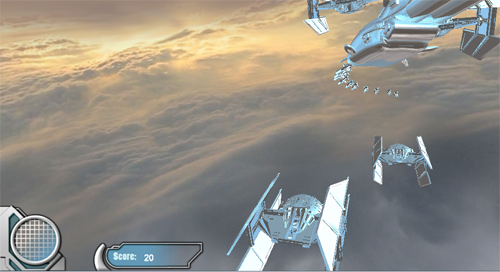 If an enemy ship is hit by a missile, it disappears and the player's score is increased. Pressing 'S' will enable/disable some sliders which control certain program parameters, used mostly for debugging/testing. The source code is compiled using Visual Studio 2008.